Following the huge success of Steven Spielberg’s 1977 Close Encounters of the Third Kind, the West’s fascination with unidentified flying objects returned with renewed vigor. New UFO societies, journals, magazines, and clubs were formed, providing fresh opportunities for debate and socialization, and another generation came to believe that the Earth was frequently visited by alien entities both benign and otherwise. 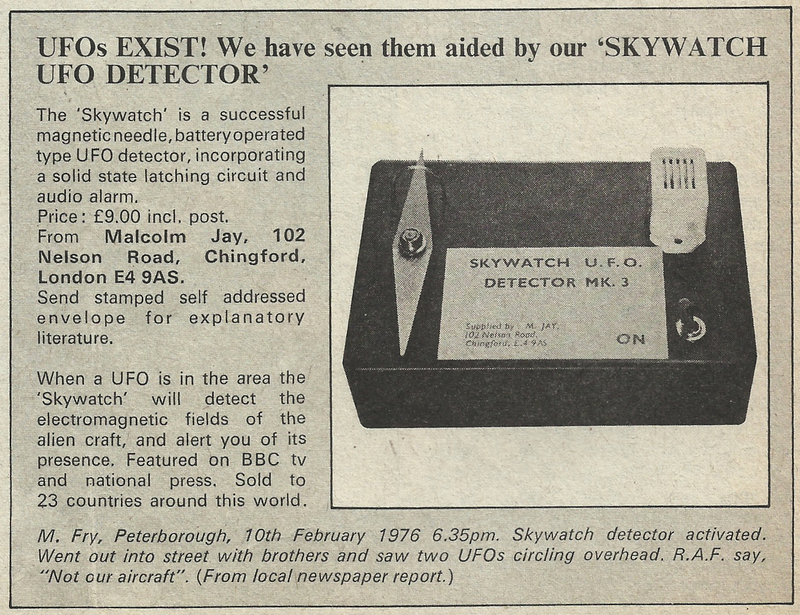 As UFOs once again became ubiquitous in the skies, the line between wishful thinking, DIY electronics, and cottage industry grew hazy, resulting in the production of devices like the Skywatch UFO Detector. The advertisement above appeared in the second issue of Britain’s Starburst, a science-fiction magazine banking on the sudden popularity of films like Star Wars and Close Encounters and published by self-styled “British Stan Lee” Dez Skinn. Variations of the ad appeared in Flying Saucer Review and other UFO-related publications during 1978. That UFOs are propelled by electromagnetic fields (what the Skywatch claims to detect) was first suggested in the 1950s. However, in 1975, a neuroscientist at Laurentian University, Michael Persinger, speculated that UFOs were actually “anomalous luminous phenomena” caused by electromagnetic fields that were “generated by stresses and strains within the earth’s crust.” Persinger subsequently experimented with what came to be known as the God Helmet, an apparatus designed to stimulate a subject’s temporal lobes with weak magnetic fields to induce religious or seemingly supernatural experiences. Persinger’s experiments, none of which have been reproducible, popularized the use of EMF meters to detect ghosts and UFOs, despite the fact that Persinger himself believes both phenomena to be hallucinatory. I’ll try and get a look at it, Narvo – thanks for the tip.